Opulence, focus and the debut of LEDs in LAPD’s retail portfolio. 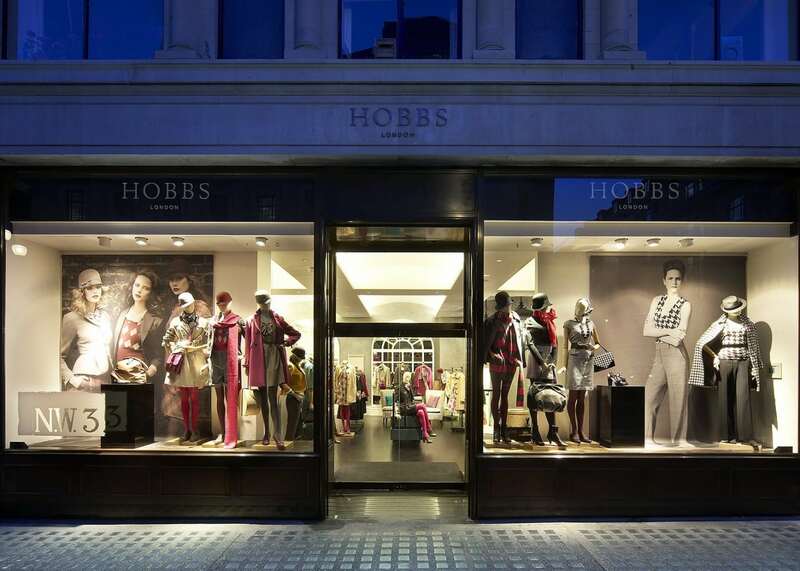 LAPD carried out the interior retail lighting design for Hobbs’ flagship store on Regent Street. The success of our concept led to further schemes in their Covent Garden, Westfield and One New Change stores. The theme for the interior design was ‘The Coach House’ and the lighting complemented the interior design in many ways. Cove lighting provided the main ambient light level in the space. Concurrently, it highlights the curved ceiling coffers. 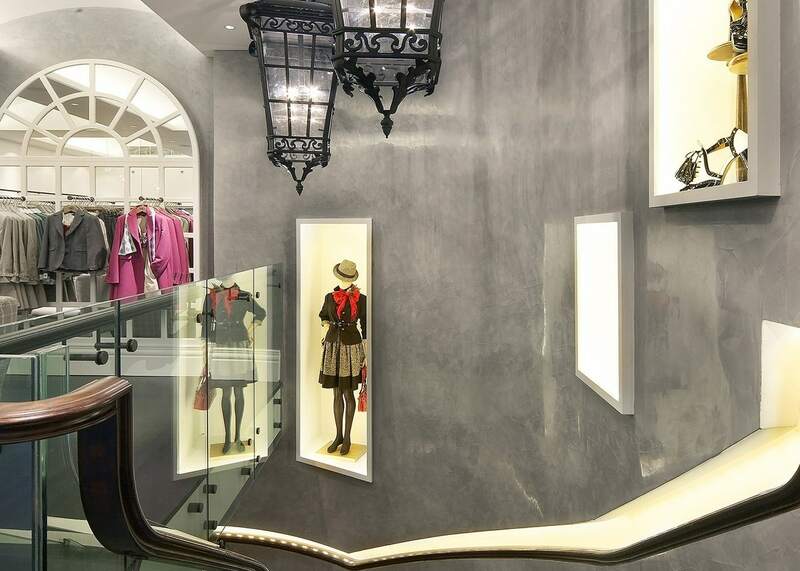 Discreet downlights, specified with specular reflectors and hidden light sources, accent the merchandise. Their careful specification minimises their impact on the clean white beams between the ceiling coffers. Where possible, additional downlights have been hidden in locations where they cannot be seen by customers, ultimately ensuring accent lighting for all merchandise. Decorative glass pendants provide identity to the reception desk as well as add visual interest to the changing room areas. Hobbs wanted to draw downstairs to the floor with most product on display. In order to achieve this, LAPD used LEDs for the first time in a retail installation. LED luminaires at the time were unable to provide efficient results from recessed ceiling luminaires. Conversely, however, they could provide impact at close offset from small linear luminaires. This allowed ‘picture frames’ to enclose display boxes at different locations down the polished plaster wall. Their visual appeal encouraged people to explore the lower floor. LEDs within a recessed detail around the period handrail and a detail just above the step line, reinforced the flow downstairs. The restoration of two large lanterns, suspended above the stairs, complemented the LED treatments. These lanterns featured capsule lamps in a central cluster to resemble gas lanterns. To prolong their lifespan, especially as suspended above the stairs, we dimmed the capsule lamps. The lighting design to the staircase and the interior re-fit increased the percentage of customers exploring the lower floor from 30% to 60%. Within the basement we designed a cove light around the perimeter, within a detail that curved and blended with the basement ceiling. This pushed light across the ceiling and raised the perceived height of the space, as well as continuing the flow of linear cove lighting from upstairs to downstairs. 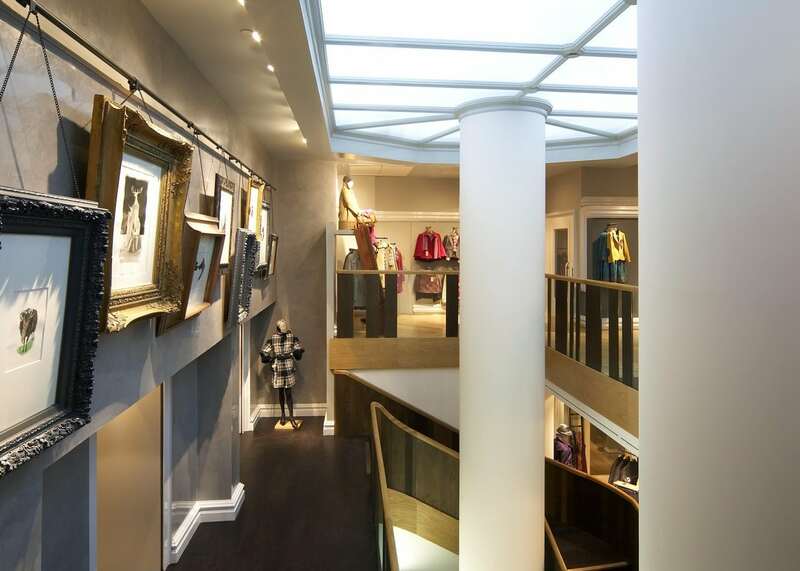 Discreet downlights create a highlight layer on the merchandise here, balancing with the accent lighting upstairs. A specular collar assists in minimising their visual impact within the space, while decorative glass pendants add interest to the shoe displays. 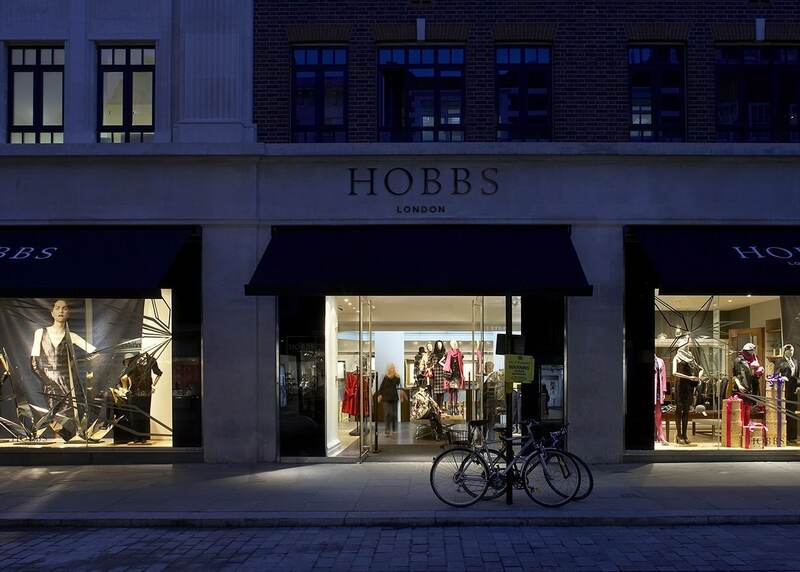 Following the success of Regent Street, Hobbs invited LAPD to work on the Covent Garden flagship store with a different interior design approach to each level. ‘The Grand Entrance’ is the first space to greet customers. The lighting in this area provided a brighter and more opulent environment whilst still maintaining some variation to the lit effect. This variation allows the merchandise to stand out. The same luminaire type used in the Regent Street store features here, but with a frosted collar around its base. The frosting allows the downlights to glow and add light to the ceiling whilst maintaining a clean look. The large central skylight draws customers further into the store. The skylight is backlit using a cool light source to mimic daylight, along with acrylic diffusers with a light transmission of 80%. Accordingly high light levels flood the Orangery three floors below and give the feeling of real daylight rather than a backlit light box. Between the Grand Entrance and the Orangerie was the library. 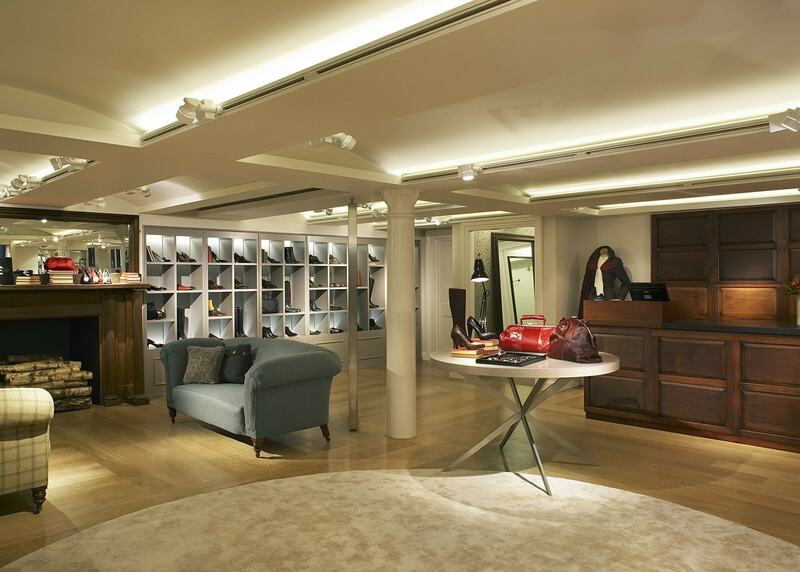 Here, slim LED profiles illuminate the gentle coffers, while small spotlights illuminate the merchandise. These spots are fitted to track integrated into the coffer edges. Illuminance levels here were much lower but still with high peaks where needed. Integrated lighting to the wall mounted shelving assisted in defining the perimeter and adding further interest to the space. Moving to the lower floor, past the Orangery bathed in light from above, recessed accent lighting and decorative pendants create a more intimate feel.